By	George Vinci. Last edited by Marios Alexandrou on August 9, 2018. About two days after you bring your puppy home, you should arrange for it to have a health checkup. This will enable the veterinarian to identify right away if anything is wrong with it. Tragically, a major health problem may sometimes be identified, and in this case you will either have to decide to return the puppy or ask the breeder for a refund. This may be difficult to arrange at a later date. If your puppy doesn't enjoy its first visit to the animal hospital, subsequent trips may be difficult for everyone concerned. 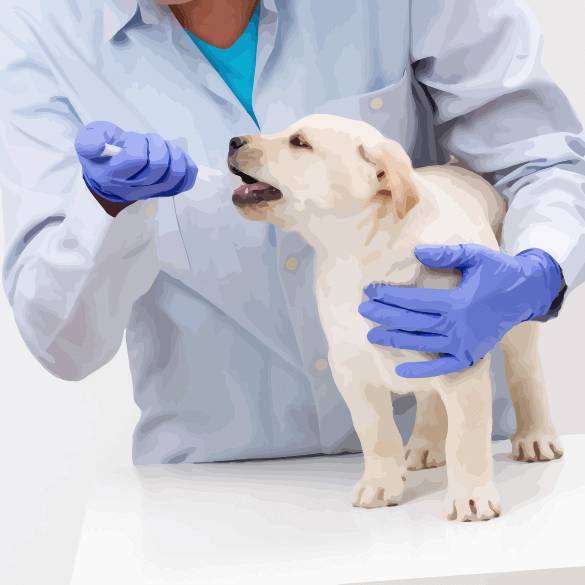 The veterinarian will reassure and calm the canine patient, but it is a good idea to take along food treats that he or she can give the puppy at the start of and on completing the examination. This will help to ensure that your puppy has only good memories of visiting the vet's and will not show fear and resistance on later visits. The veterinarian may start your puppy's course of shots against the common canine infectious diseases rightaway or suggest you make an appointment to come back in a week or so. The first shots are normally given at between 4 and 8 weeks, and are followed by one or two boosters to confer complete protection on the puppy. Protection is not complete until about a week after the last booster has been given, and during that time the puppy should not be allowed outside the house or yard unless you are carrying it. Your vet will hand you a vaccination certificate showing what shots the puppy has been given. This should be kept in a safe place so that the dog's annual booster shots can be recorded on it. The veterinarian will also advise you about protection against parasites. Virtually all puppies carry roundworms. These are transmitted from the mother through the placenta before birth, and also in her milk. If their numbers are allowed to increase, they can cause serious illness. Your vet will advise you about the most suitable deworming preparation to use. Puppies should be routinely treated every two weeks until they are 12 weeks, then monthly to age 6 months. In parts of the world where heartworm is endemic, a heartworm preventive taken every month after the age of 3 months also gives protection against roundworm. Ask for advice on antiflea protection. Itchiness and small clusters of dark specks of dirt in the coat are signs that your puppy is infested. The fleas reproduce very rapidly, so you will need to start treatment immediately. Other pets and bedding, and your carpets and upholstery, will need to be treated, too. Check your puppy's condition everyday. Clean the sleep out of its eyes in the morning. Examine its ears and look inside its mouth. Run your fingers backward through the coat to look for fleas and lift the tail to make sure that the bottom is clean. This routine will make the puppy used to being handled and give early warning of any problems that develop. You should also groom the puppy from time to time. Arrange for a health checkup within a week of bringing your puppy home. Ensure that it completes the full program of immunization shots. Continue with its deworming treatment. Groom your puppy regularly; check the coat for fleas, and the ears for redness and other signs of irritation. Inspect your puppy's teeth to make sure they are developing properly. J Consider paying for medical insurance. When Jess, my Jack Russell pup, threw up, he brought up a heap of worms that looked like spaghetti. What were they, and are they harmful to us? These spaghetti-like worms are roundworms, which live in the puppy's stomach and small intestine. The worms themselves are not dangerous to humans, but the adult roundworm produces hundreds of eggs that are passed in the dog's feces. After about three weeks in the environment, they hatch out into larvae. If a child were to take in some of the larvae — for example, off a sucked finger—they may, in exceptional circumstances, cause health problems. The answer is to deworm your puppy regularly and to clean up any messes it makes. Woody, my 9-week-old Collie, has just started his immunization program, and the veterinarian has told me not to let him out in public areas for at least another month. Why not? Will it affect his development if I keep him home all the time? Until his booster shots have “taken,” Woody will not have full protection against infectious canine diseases, which he can easily pick up from sniffing the places where other, unimmunized dogs have been. However, it is very important that Woody is not isolated from the outside world at this early age, so introduce him to as many stimuli as possible. Carry him outdoors to get him used to street noises and traffic, and take him in the car with you when possible so that Woody has plenty of new experiences. Encourage friends and neighbors to stop by and meet him, especially if they have small children. Download the FREE Dog Breed Profiles today!